As the prepaid card industry explodes with growth, watch out for cards that are loaded with fees or that claim to help you improve your credit score. 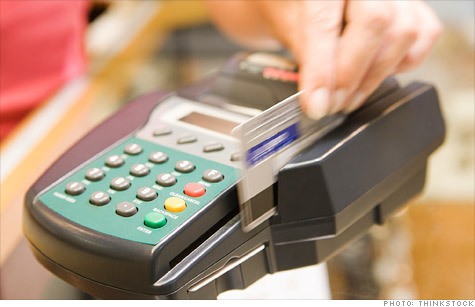 NEW YORK (CNNMoney) -- Issuers of prepaid debit cards are taking heat over high fees and how they market to consumers. Prepaid cards give consumers an alternative to traditional bank accounts by letting them load their own money onto what is essentially a debit card. They typically target consumers who have few other banking options because they have limited or poor credit. But they can come at a cost. "There are major misconceptions about the benefits of prepaid cards," said John Ulzheimer, CEO of SmartCredit.com. "Consumers need to realize that any insinuation that a prepaid card is less expensive than a debit card is false, and any claim that it will help you rebuild credit is just a lie." Despite these drawbacks, business is booming. Last year, consumers loaded about $57 billion onto prepaid debit cards, up from $41 billion the year before. That amount is expected to surge by 44% to $82 billion this year and rise to $117 billion by 2013, according to the Mercator Advisory Group. Fees, fees and more fees: The average prepaid card costs nearly $300 a year in basic fees, such as monthly charges, ATM fees and reloading fees, according to a study of 40 prepaid cards conducted by credit card comparison site NerdWallet. And that doesn't even count additional costs for activating or canceling the account or receiving paper statements. Conventional debit cards from the five biggest banks don't charge reloading fees, and ATM use is free, as long as you stay within their networks. They do charge monthly fees, however, which average $110 a year if customers don't meet requirements to get fees waived like carrying a minimum balance, NerdWallet found. Not all prepaid cards carry sky-high fees, however. And for some consumers, a prepaid card can actually be a better option than a bank account. (Read 5 things you need to know about prepaid cards). Credit building confusion: A common misconception among consumers is that prepaid cards will help them improve their credit, said Ulzheimer of SmartCredit.com. "A prepaid debit card is not a credit product -- it's basically a gift card with fees," he said. "There's no extension of credit, no underwriting, no statements, no interest, no due date, no late fees -- there's nothing similar to managing a real credit card." And it can be confusing to consumers when issuers advertise a relationship with a credit bureau, Ulzheimer said. For example, Suze Orman's Approved Card, issued by Bancorp Bank (TBBK), says prominently on its website that it is "the first prepaid card in history to share information with TransUnion, a major credit bureau." It also discloses that the information is anonymous and won't show up on a customer's credit report, meaning it won't be considered in a FICO score. But some consumers still think the prepaid card will help their credit -- something that is evident from numerous messages posted on online forums and credit card comparison websites. "FICO will do an evaluation to determine if they can give you a score ... throughout the time you have the card your information is shared with the 3 credit score companies. Cheers!" wrote one consumer on CardHub.com. Because of comments like these, CardHub responded: "Unfortunately, the marketing promotion around the Approved Card has all of us confused ... the truth is that this prepaid card will do nothing for your FICO score." Even if TransUnion agreed to include prepaid data on its reports, and lenders decided to look at it when making lending decisions, TransUnion is only one of three credit bureaus. Should a lender pull a report from one of the two other credit bureaus, they would see no improvement in an Approved Card holder's credit, said Suzanne Martindale, a staff attorney at Consumers Union. TransUnion said "it is too soon to offer up any insights" about its review of the Approved Card's anonymous data. Both Experian and Equifax said they don't include prepaid card information on consumer reports because it isn't related to a debt obligation, like a credit card balance or a mortgage. However, Experian "expects to collect prepaid data for study purposes," according to Steven Wagner, president of consumer information services. Meanwhile, Equifax spokesman Tim Klein said that even if it did include prepaid card spending on its reports, it most likely wouldn't help a consumer obtain credit. The algorithms used to calculate credit scores don't include prepaid card data and most creditors use these scores instead of the content of credit reports to make lending decisions. The Approved Card didn't respond to requests for comment. The wrong path to credit? In 2003, another prepaid card, Russell Simmon's RushCard, started enrolling customers in a program called "RushPath to Credit." It claimed to help customers "build a positive credit file" but was reporting consumers' data to an alternative credit agency that most lenders don't even use. RushCard President Rob Rosenblatt said he discontinued the program last October, soon after he joined the company, because it didn't meet his standards. According to Rosenblatt, some businesses, like auto leasing companies and jewelry stores, may be willing to look at reports from an alternative credit reporting agency. But the "RushPath to Credit" was not helping customers build their credit with the three major credit bureaus. The program's name has since been changed to the "RushCard Transaction Reporting Service" for the 10,000 to 20,000 customers he estimates are still enrolled. Other prepaid card issuers have offered small lines of credit that Experian said have been included on credit reports. However, a Consumer Reports study warns that these credit lines typically come with very high interest rates. Consumer Reports found that "these prepaid products do not provide sufficient information to build the type of credit report that consumers get with mainstream credit products, nor will consumers obtain fairly priced short term credit lines." Meanwhile, Florida Attorney General Pam Bondi has been investigating five major prepaid card issuers for possible deceptive practices including hiding fees and claiming that their products can improve customers' credit scores. The Florida investigation was launched last year and is ongoing, Bondi's office said. Unirush Financial Services, the issuer of RushCard, is among the issuers being investigated. Bancorp Bank, which issues Orman's Approved Card, is not part of the investigation. The Consumer Financial Protection Bureau, the federal government's new consumer watchdog, has the authority to regulate prepaid card issuers. But it hasn't taken public action yet. It is determining whether it will also be able to start regularly looking at issuers' books.